Bananas, instant vanilla pudding, 'nilla wafer cookies and cool whip were the stuff of the most wonderful dessert imaginable... or so I thought as a kid. And while a simple banana pudding with ready made ingredients has its place - it certainly held a place in my heart for a long time - this dessert is none of those things and yet everything at the same time. There are no wafer cookies in this dessert, rather a flaky disk of homemade pie crust, baked right in the bottom of the jar. 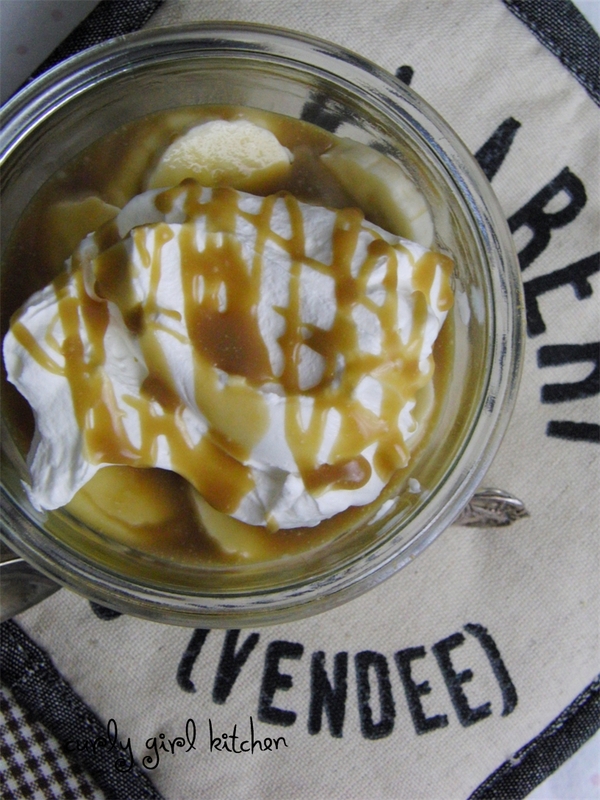 Topped with sliced bananas, homemade vanilla custard, caramel sauce, freshly whipped cream and little pinch of kosher salt, it's the more sophisticated cousin of that beloved banana pudding that all our moms served us time and again. 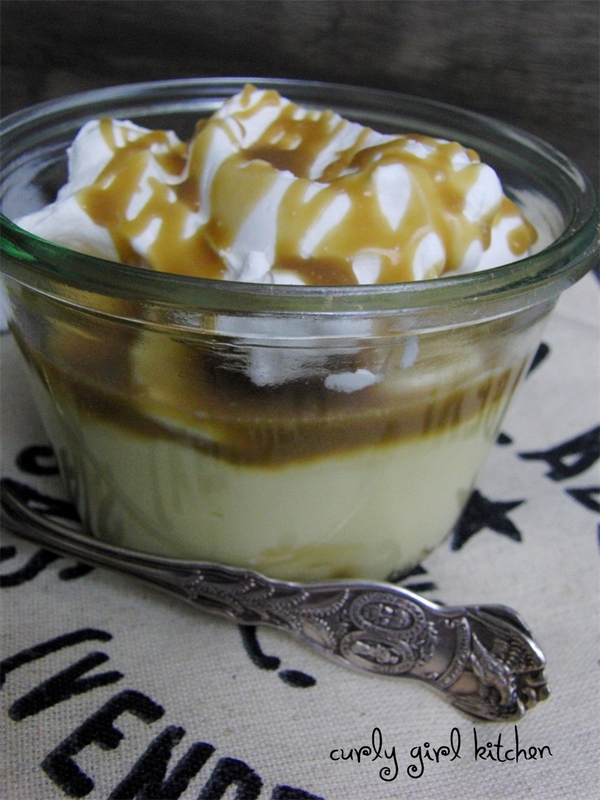 In my efforts to have dessert once a week without having so much leftover, I'm trying to make more recipes that just make a couple of servings, so I created this recipe for two servings of pie in jars. If you'd like to make a whole pie, I've included instructions for that also. Press the circles of dough into the bottom of the jars. Bake for approximately 15 minutes, until golden brown and crisp. Cool completely. To make the custard (you may want to make it a day ahead so it has plenty of time to chill), combine the milk, sugar and cornstarch in a medium saucepan. Heat over medium low heat, just until hot to the touch but not boiling. Slowly stream about half the hot milk into the egg yolks, whisking the yolks to temper. Scrape the egg/milk mixture back into the saucepan. Whisking constantly, cook for several minutes until very thick like pudding. Remove from the heat and stir in the vanilla and butter (if making a larger amount of custard for a whole pie, the seeds of a vanilla bean steeped in the milk would be even better than extract). Pour the custard through a mesh strainer into a bowl. Cover with plastic wrap, right against the custard, and refrigerate for 4 hours, or overnight. Thinly slice the banana. Place half the banana slices on top of the baked and cooled pie crust in the jar. 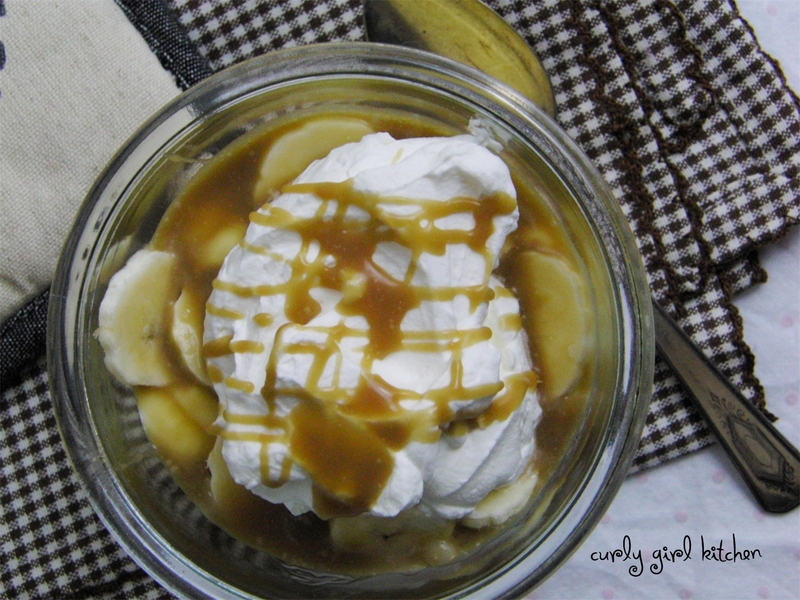 Drizzle bananas with half the caramel. Spoon the chilled custard over the bananas. 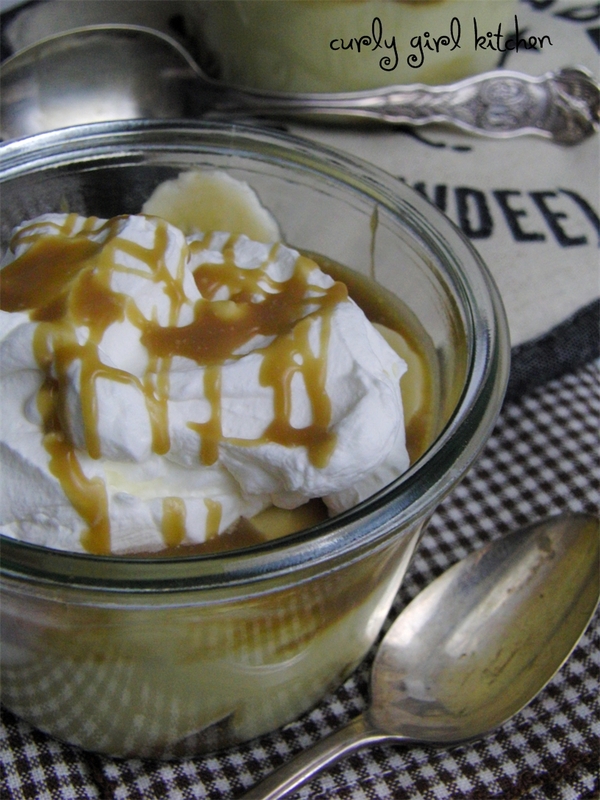 Top with whipped cream, drizzle with the rest of the caramel and sprinkle with a pinch of kosher salt. Enjoy right away or refrigerate for a few hours before serving. To make this recipe into a whole pie, you will need to prebake your pie crust first in a pie pan and cool (it's best to "blind bake" an unfilled crust so that it doesn't shrink up). Prepare the custard as directed above, but make 3x the amount (to use a vanilla bean instead of extract, simply scrape the seeds from half or a whole vanilla bean into the milk before starting, then proceed as directed, being sure to chill thoroughly). Use 3 bananas (tossed with a teaspoon or two of lemon juice to prevent browning while the pie chills) and about 1/2 cup caramel sauce. After assembling the pie, let it chill for a few more hours to be sure the custard is set before slicing. Top with the whipped cream right before serving.